If you are one of the many thousands of players who enjoy the Rainbow Riches online slot then you are sure to enjoy the Rainbow Riches Bingo Room at Sun Bingo. This is a fun bingo room themed around Rainbow Riches and from now until St Patrick’s day the jackpots in the Bronze, Silver and Gold pots are going to be doubled. To take part you will need to be a registered player and if you are not then signing up is a very quick process that only takes a few moments. 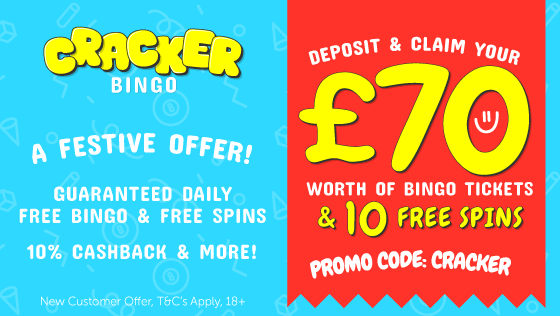 Simply click on either of the buttons on this page and you will be taken to the Sun Bingo Login / Homepage where you can register as a new player. You will also be able to take advantage of the Sun Bingo Welcome Offer when you deposit at least £10. 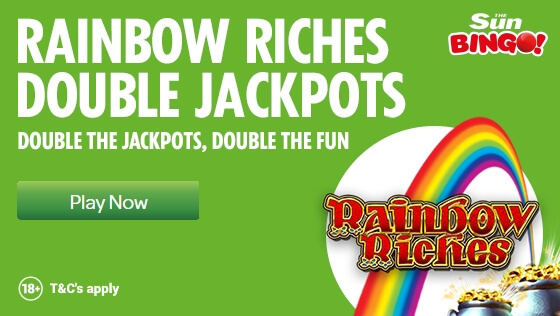 Once you are a member, you just need to play in the Rainbow Riches Bingo room up until 17th March which is when the promotion ends. During this promotional period, the Bronze pot will be worth £100, the Silver pot worth £300 and the Gold pot worth £600. Your bingo tickets in this room will cost 5p – 15p with a maximum of 50 tickets being allowed per player. During any of the online bingo games, random clovers are shown. For each clover shown, you will see the leprechaun jumping along the numbers. If he lands on any of the pots/jackpots, then the jackpot amount will be divided equally among all tickets in play during that game. This process continues throughout the day. Once the leprechaun reaches the Gold Jackpot, it starts again from number 1. Have fun and play responsibly. 18+ only. Full terms and conditions are available on the Sun Bingo website.